Paul Gentilozzi at the Rolex 24hrs of Daytona in an XKR! A privately developed and entered Jaguar XKR will line up for one of endurance racing top event in the hands of Trans Am champion Paul Gentilozzi, who just brought Jaguar its first Trans Am constructor and driver title in 25 years. Developed and prepared by Gentilozzis own Rocketsport Racing, the XKR bodied race car will line up in GTS class in the season's first endurance race, February 2nd - 3rd. The car will be co driven by Michael Lauer, who competed twice in the event, and two other drivers not yet named. Gentilozzi is no stranger to Daytona's 24 hours having co driven a newly designed Saleen S7R last year which only finished in 74th place despite a strong driver lineup; he is however best remembered for his class win in 1994 driving a Nissan 300SX. By returning to Daytona in a car built by his own team, Gentilozzi will be a serious contender for a class win as Rocketsport has become one of the most respected team in road racing, winning 3 Trans Am championship in 4 years. The Daytona XKR is a slightly modified version of the Trans Am XKR Paul Gentilozzi has developed over the past 2 seasons; a carbon fiber / Kevlar body built on a metal tube race chassis and powered by a American pushrod V8 it shares virtually nothing with its road going namesake. During the first practice session, January 3rd and 4th Gentilozzi topped the time sheets in GTS class, both days, a good sign ! Trans Am : Paul Gentilozzi clinches the 2001 drivers title. After bringing Jaguar its first Trans Am constructor title since 1978, Rocketsports driver Paul Gentilozzi clinched his 3rd Trans Am drivers championship at Houston despite mechanical problems which dropped him from pole to 6th place by the time the race ended. 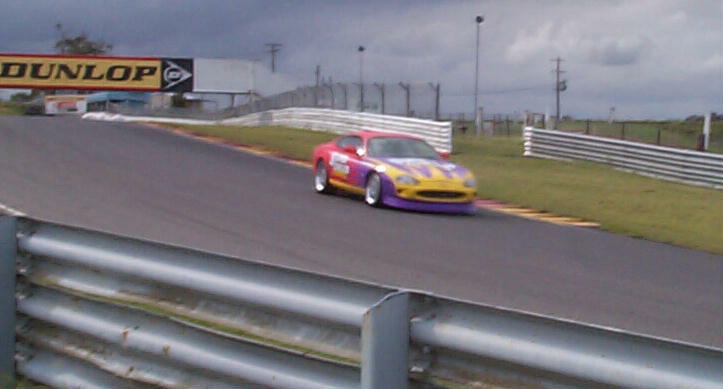 Gentilozzis Teammate Johnny Miller who ran strong in other XKR but ran out of fuel in the final lap finished the season 3 rd in the standings. This is the 3rd Trans Am championship for Paul Gentilozzi who won in 1998 and 1999 driving a Corvette and a Mustang. In 2000, the first year Trans Am XKR took to the track, he failed to clinch the title after an oil pump failure while leading the final race and had to settle for 2nd. First Trans-Am Constructor title for Jaguar since 1978 ! With his fourth win of the season driving a Trans-Am XKR, Paul Gentilozzi clinches the Constructor Championship for Jaguar, the first since Bob Tulius 1978 title won in a V12 XJS. Gentilozzi started from pole at Mid Ohio and led the entire race taking the checkered flag after setting the race fastest lap, earning him the $ 12 500 Simple Green Clean Sweep bonus. Michael Lewis and Johnny Miller brought in their XKRs in 5th and 6th place. The race was filled with controversy after SCCA / Panoz officials wrongly penalized 2000 champion Mangusta driver Brian Simo for jumping the start when in fact another yellow car had committed the offense. Officials refused to reverse the call despite video evidence and Simo had to serve his 10 seconds stop and go penalty virtually ending his title defense. With only 2 races left in the season, Gentilozzi is well on the way to win his 3rd Trans Am title and Jaguar's first driver title since Bob Tulius in 1978. 2002 : The Nations Cup XKR get the mighty Jaguar V12 ! 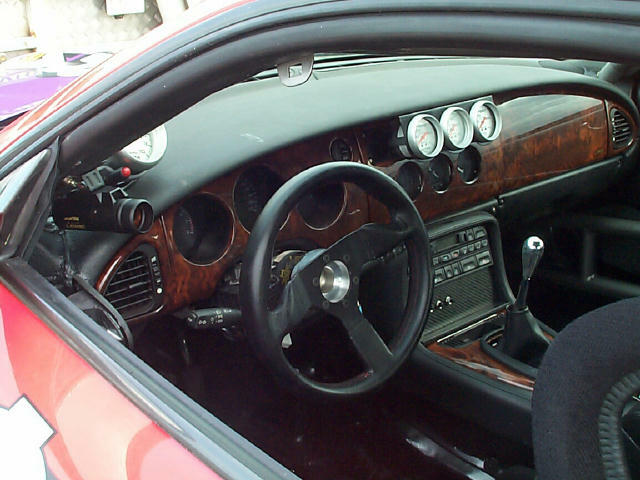 2001 was the first full season of racing for what is probably the only production based XK8 race car, a modified XK8 built by Australian racer Mark Trenoweth for the Nations Cup, and while the results were encouraging in the handling departement the car was low on power partly because of overheating in the supercharger. The XKR-T started 11 races and finished 10, with one 3rd place as a best result. For 2002, the team is going back to the drawing board and calling on a proven powerplant to take the fight to improved Lamborghinis, Ferraris, Vipers and Porsches GT3 : the mighty Jaguar V12. Trenowerth and is team are no strangers to the Le Mans winning engine, having succesfully campaigned XJS in the 70s and 80s so the choice is logical. The team was able to obtain the Nations Cup organizers approval and the V12 fits under the bonnet with no modifications to the body; in fact one has already been trial fitted and the conversion of a road car purchased in Japan is currently under way. No decision has been made yet on the future of the existing V8 XKR-T, it is for sale and will probably remain in the series thanks to the creation of a new class for the more powerful cars in the Nations Cup. Late in the 2000 season, the Super Cheap Auto Racing team had announced its entry of a Jaguar XKR in the final GTP Nations Cup race at Bathurst but couldn't get the car ready in time to compete. More details are now available on the project which is just as exciting as the car paint scheme. When the SCAR XKR-T lines up on the grid for the first race of the 2001 Nations Cup it will be the first time in decades that a new Jaguar race car build from a stock road car will compete on the track. Unlike the Trans Am XKR, this cat is the real thing... no tube chassis with carbonfiber shell and no Chevy V8 under the hood ! Built by Jaguar racer / fanatic Mark Trenoweth, the XKR-T started as a real road car in Canada where it was purchased in february 2000. 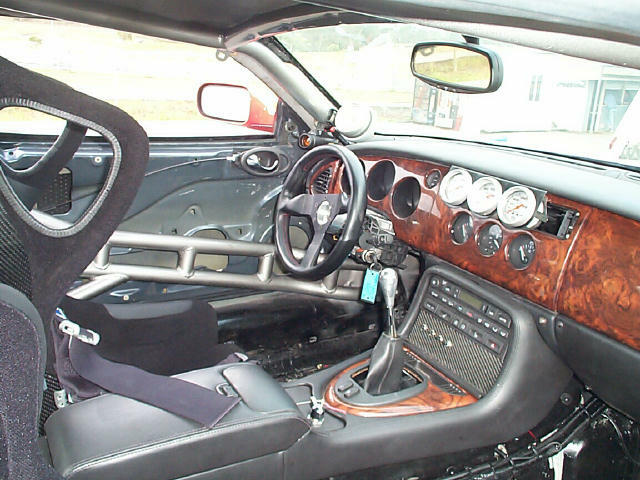 After receiving a roll cage and fuel cell in the US, it was shipped down under where further modifications were done, including installation of a 6 speed manual transmission, racing brakes, intake and exhaust work to increase HP to 410 and special Cosworth racing conrods, needed to use the engine in a racing environment. Little work was done on the body except trimming some weight and installing a front spoiler and large rear wing. Sadly, Trenoweth received no support from Jaguar despite his large personal investment in the project and his prior experience in racing ( he was Jaguar International Driver of the year in 1985 ). 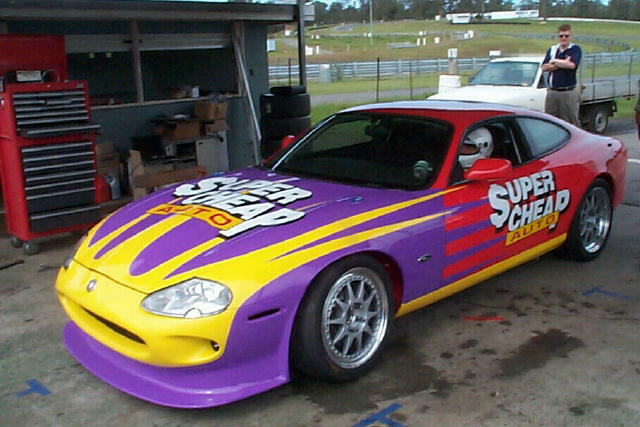 One of last step was to paint the car in the flashy colors of the sponsor, Super Cheap, a auto accessory supplier whose boss / race driver Bob Thorn will be driving the car.